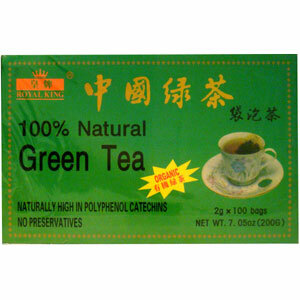 Green tea is regarded as an antioxidant. The polyphenols, especially EGCG, prevent free radical damage and have even been found to detoxify free radicals produced by the environment. Green Tea has been shown to have many health benefits when used continuously. This is due to the power of its constituents, which include carotenoids, chlorophyll, polysaccharides, fats, vitamins C and E, manganese, potassium and zinc. Green tea is regarded as an antioxidant. The polyphenols, especially EGCG, prevent free radical damage and have even been found to detoxify free radicals produced by the environment. Steep one tea bag in a cup of boiled water for 2 to 4 minutes before serving.